With its delicious German and continental fare, and unique atmosphere, you'll look forward to returning again, The many and varied interior dining rooms will intrigue you; our walls are decorated with authentic German and Alpine memorabilia, Warm up on cold winter nights by one of three blazing fireplaces. Shaded by large trees and brightly colored umbrellas, the outside patio is perfect for dining during pleasant weather, of which is frequently seen in Colorado Springs. The Biergarten is the perfect place for a hot meal and a cold German Beer! On Friday and Saturday evenings, you can enjoy the music of strolling musicians. If you don't already feel transported to another place and time, let the music take you there! 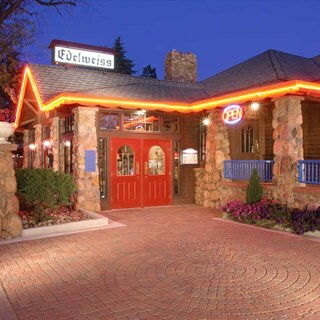 We can't wait to see you, so come in to Edelweiss today for a fresh taste of Bavaria! Edelweiss is the perfect place for an intimate dinner or special party. Our newly remodeled Ratskeller with its stone walls and cozy booths is the perfect party area for groups. Our East can seat up to 130 for those larger events. No matter the occasion, Christmas parties, birthdays, reunions, retirements, rehearsals, or any other celebration, your visit will be a special one. 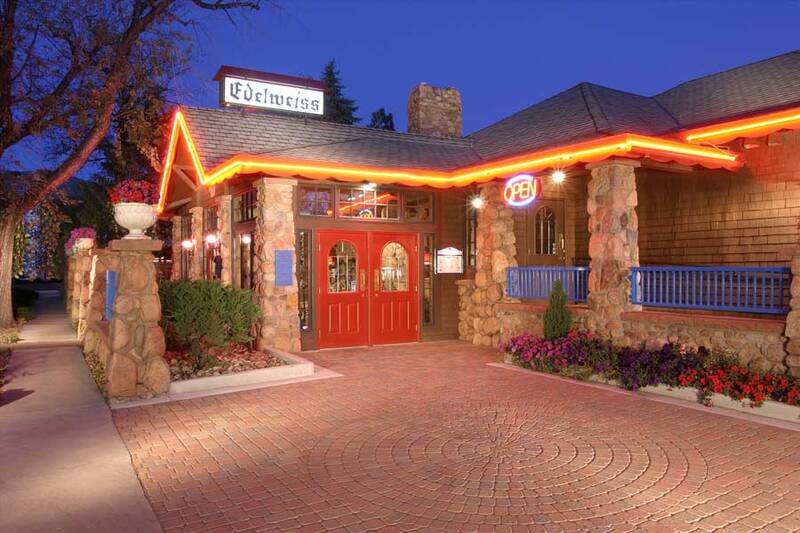 For over 40 years this family-owned German Restaurant on the south side of Colorado Springs has served over a million happy customers. The restaurant invites guests to dine in one of its several rooms decorated with artifacts from Europe. With strolling musicians on Friday and Saturday nights, three blazing fireplaces in winter, and an authentic "Biergarten" in summer, you are sure to enter into another world as a guest at Edelweiss. The authentic menu with a variety of Old World German dishes includes Schnitzel, Bratwurst, and Sauerbraten, with newer-age items such as Flammekuchen and Maultaschen. For those not so adventurous palates Edelweiss offers other Continental fare such as Chicken Cordon Bleu, Filet Tournedos, or Fresh Salmon Filet. Imported German Beers and Wines can be ordered to compliment any of the flavorful dishes. The European-trained Swiss Pastry Chef bakes all of the desserts from scratch, so save room for one of the rich Tortes or pastries, or take some to go. Thank you for a great experience with a great waiter!! They were outstanding!! The food was great, the waitstaff was even better. One of our favorite places to eat and bring guests! Service was a bit stressed this visit. Matt was our server and he was exceptional. We had a very enjoyable evening and are looking forward to returning. The waitress was very prompt, polite, and knowledgeable. We enjoyed ourselves very much. The food was delicious, and the portions were very generous. We ordered some dessert to take home and it was outstanding as well! We cannot wait until the weather warms  up enough for the beer garden to open! Excellent is an understatement. If your looking for the real German deal in Colorado, this is it! Our family went for Easter dinner and asked for a regular item off the normal menu (they had a holiday special menu only) AND THEY MADE IT FOR US. Food quality has gone down a bit. Staff seem annoyed. I think a refresh on the recipes and a little more gemutlichkeit is in order. Excellent food and friendly, top notch service in a very comfortable and pleasant setting. Dinner serving may be on the large size, if you could maybe cut down on the serving size some, I believe people would still come in and you may be able to up sale more desserts. I always want to have room for a fine German beer and dessert and always seem overly full. I know I can take dessert to go. I've never had a bad meal and the wait staff is always awesome. We spend every Holiday here! Fantastic authentic German food and atmosphere. I always enjoy coming here. Was a great time and food, drinks were awesome! Trying to find places to eat that can accommodate 120+ people is difficult at best. Edelweiss' staff makes it a breeze! I've been taking my Porsche Club here since 2006 and everytime they make it a joy to work with them and they always treat us extremely well. Thank you to all the staff at Edelweiss for another successful event! What a beautiful setting and lovely atmosphere! The service and food were wonderful! Always a fun time. Great service. Fantastic, authentic food with a welcoming atmosphere!